Chester Weber and Jane Clark’s team of KWPN geldings navigate the water obstacle at Saumur. (Photo courtesy of Team Weber). 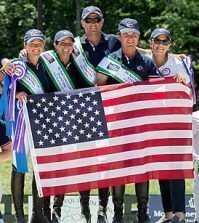 Riesenbeck, Germany (June 26, 2017) – Fourteen-time USEF Four-in-Hand National Combined Driving Champion and three-time World Equestrian Games Silver Medalist Chester Weber started off strong on the first leg of his European tournament schedule by seizing top placings at the Saumur CAI4* in France and the Riesenbeck CAI3* in Germany. Leading Jane Clark and Weber’s team to win the dressage phase at Saumur were Splash and First Edition, with Boris W. and Bastiaan in the left and right wheel positions. Team Weber headed into phase two of their first international competition of the 2017 season with a score of 43.3 points to finish up their first European tournament by winning the reserve title. Weber and Jane Clark’s team of KWPN geldings then forged ahead to secure another top placing at Riesenbeck, Germany, June 22-25 with a second place in the Riesenbeck dressage phase and a fourth in the cones to finish in the top three in the competition. Next up for Team Weber is the World Equestrian Festival CHIO4 at Aachen, Germany where Weber strives to repeat history. In 2012, Weber had a record-breaking dressage score at Aachen and then went on in 2014, to make history as the first and only American to win the Four-In-Hand division at the Aachen CHIO4. 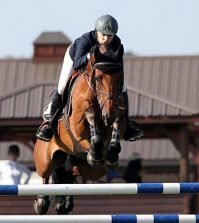 Weber looks forward to matching and besting his 2012 and 2014 performances at Aachen with an eye focused on competing at the World Equestrian Games, slated to take place in 2018, at Tryon International Equestrian Center, North Carolina. “We were pleased with the horses and they clearly demonstrated their potential. Both Bastiaan and First Edition did well for their first big international outings. 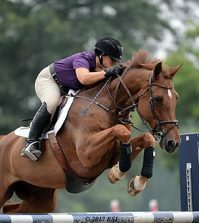 We are looking forward to competing at Aachen and of course we remain focused on laying the foundation to compete at the 2018 World Equestrian Games,” commented Weber. Weber, who continues to be a major contender in the international world of four-in-hand combined driving, is also an avid supporter of the sport of driving – dedicated to promoting the equestrian sport on a national and international level. For Team Weber updates, results, photos, and combined driving news as competition in Europe continues, follow Chester Weber on his official Facebook page, Instagram @ChesterWeber, or visit www.chesterweber.com.